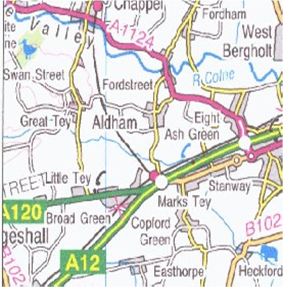 To find us from the main A12 road which runs from London through East Anglia, take the A120 at Marks Tey signed for Bishops Stortford and Stansted. After 1.5 miles turn right for Great Tey opposite Poplar Nurseries. Go through Great Tey and take the fourth turn on the left signed for Earls Colne (opposite Scenterfields).This is just before you leave the speed restrictions. After one mile turn right down a no through road marked Lamberts Lane. Greenlands is after Lamberts Farm farmyard on the right. If you are approaching us from Halstead on the A1124, then pass straight through Earls Colne until you reach Wakes Colne. 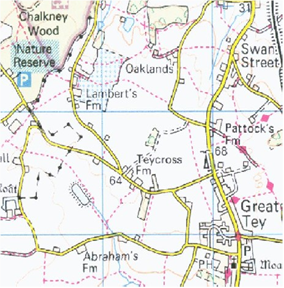 Turn right just before the Chappel viaduct signed Great Tey. After passing the village sign for Great Tey and entering the speed restrictions, turn right signed Earls Colne.